The tree house is done and is engineered to hold 20 visitors plus a good supply of cider. I’ve suggested to my daughter that she gets married in the treehouse, but she thinks I’m out of my mind. 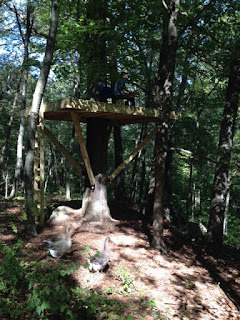 Many folks have asked - why a treehouse? First answer - it can serve an outdoor workspace on those wonderful days in the Spring and Fall when the air is dry and the temperature is in the high 60’s. I made a desk and chair from the scrap wood left over from the tree house joists. Below I'm sitting in my desk and chair looking out at the forest canopy - about a 50 foot drop down the hillside to the farm below. Second - every summer thousands of fireflies begin their nightly flights from the grasses in the swale below the treehouse. We’ll be able to sit above them and watch them rise. Deer, foxes, coyotes, raccoons and turkeys frequent the area and we’ll have a unique perspective on them from the forest canopy. Third - the treehouse becomes the focal point of our upper forest. It’s at the highest point in our land, at the center of the western half of the property. It’s brought new visibility and utility to the dense forest. I can imagine constructing other elements in the canopy - bridges/walkways, observation platforms and a zip line transportation system. Now that I understand treehouse engineering the possibilities are limitless. Next weekend, we’ll harvest Northern Spy and Macoun. The following weekend, we’ll crush our first batch of 2015 cider. The pheasants, although wild, continue to visit us every day. They’ve learned to recognize our voices and come when called for their afternoon mealworms. We’ve kept the guinea population stable by emptying their nests every weekend. This year, we’ve lost 4 ducks through predation and disease. Luckily we’ve not lost a single chicken or goose. Our winter preparations continue. We’ve walked the property looking for trees with dead branches and preemptively cut them down. We’ve chipped the branches into mulch and spread the chips on our 1.5 miles of trails. Our Umass Organic Vegetable Production course is going well. Every Sunday is filled with reading and homework. By the end of the semester I hope to have solved our issues with cucumber and squash beetles using an organic approach. The weather is finally cooling and nights are dipping into the 40’s. This weekend, I'll clear out the last of tomatoes, peppers, and eggplant from the hoophouse and plant Fall lettuce. We’ve enjoyed the bounty of Summer and look forward to the leafy greens and root vegetables of Fall, followed by a winter that will give us a chance to catch up on all the indoor maintenance tasks.